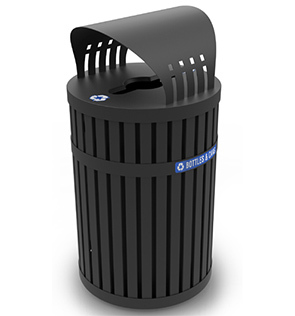 Add a spiffy, positive impact to green initiatives with these ArchTec Parkview Recyclers. 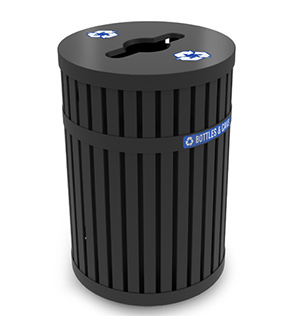 The 45 gallon all-steel recycling center features a 12" x 5" mixed opening lid that encourages proper litter disposal while concealing contents and odors. Built-in handles and bag clips come standard on the liner to help prevent unwanted bag slippages, making routine maintenance a cinch. A discrete lid to base cable attachment ensures the top will not be lost when servicing the removable black powder-coated liner. Plastic Bottles, Aluminum, Glass, Bottles & Cans, Paper, Mixed Recyclables decals included along with 2 Recycle logos.